People often think stewardship is a buzzword or fad. Or a shameless plug for money. Or a “program.” But it’s none of those — it’s a way of collaborating with God! 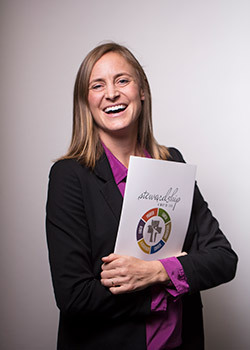 Diana Liska, director of stewardship for the Diocese of Fort Worth, recently joined the NTC for a conversation on why stewardship is a key part of our Catholic faith and a way of life for us disciples. What is stewardship as defined by our Church and our faith? “Stewardship, in the easiest definition, is gift of self. It’s giving back to God what He gave us, which is everything. “It’s a lifestyle based on gratitude for all that God has given us and then generously sharing those gifts with the understanding that we are stewards of these. We’re not meant to hoard them and keep them but to share them with others and be a conduit of God’s graces. How do you help foster stewardship in our diocese? Liska says there are currently 11 parishes with active stewardship committees with another on the way. What does stewardship at the parish level look like? What are some of the things parishes with stewardship committees have been doing? “Some of the biggest [contributions] are perpetual Adoration. What St. Peter the Apostle Parish and Sacred Heart Parish in Wichita Falls have done came from stewardship. What is the difference between discipleship and stewardship? “Stewardship is the way we live out our discipleship, it is how we collaborate with God. God has given each of us unique talents, experiences, and skills, and it is our duty to use them to build up the Kingdom of God here on earth. “But I think sometimes we get confused when we hear evangelization, discipleship, stewardship, and how they work together. “Discipleship is saying ‘yes’ to God. Like, ‘Okay God, I’m gonna follow You and Your commandments and do what You want me to do.’ Then He says, ‘Okay, great, awesome, now get to work.’ And that’s stewardship. That’s the time and the talent piece... we’re giving back, we’re saying thanks, we’re trusting God that He’s gonna take care of us as disciples, and so therefore we’re able to be generous. What role does hospitality play in our faith life and in stewardship? “So hospitality is the first pillar of stewardship. Those pillars progress from hospitality, prayer, formation, and service. “But without hospitality, the other three are never going to come. Prayer is the most important, but if we’re not hospitable and welcoming people in, they’re never going to come back. We’re never going to be able to form them, and they’re probably not going to serve. So hospitality is such a good starting point because it makes people want to come back to learn more about Christ and build a relationship with Him through prayer. “I joke around in my parishes that people always say, ‘Oh, we don’t have the budget for that. We can’t do this. We can’t do that.’ But a smile is free. How can we start living stewardship in our day-to-day? “I say start with 10 minutes of daily prayer. Just start. Make a commitment to start your day by thanking God if you’re not already doing that. “It’s a good way to get out of yourself and to think about what your true gifts are — especially for someone who struggles with gratitude or jealousy. How else can we show gratitude toward God in our lives? People often think stewardship is a buzzword or fad. Or a shameless plug for money. Or a “program.” But it’s none of those — it’s a way of collaborating with God!